As Smilekrafters, we believe in creating smiles and forging relationships that last a lifetime. So from the very first time you set foot into our dental clinic in Pune, India, we’ll be with you throughout the way. Right from the initial analysis to answering all your queries, and then formulating a tailored plan to its perfect execution, we’ll stand by you. But unlike other dental clinics, that’s not where it stops for us. We understand that your dental concerns and needs – particularly more so in the case of cosmetic dentistry and implant dentistry may well require maintenance over the years. Be it a warranty for your crowns, maintenance of dental implants or even re-cementing a veneer, rest assured we’ve got you covered. While our experienced dental team and ever-smiling attitude sets us apart, we pride ourselves in achieving results that make a difference in your life and care that you will remember for years to come! For all the patients who have received any treatment at our dental clinic in Pune, all future consultations and check ups, be it personal, or over phone and email would be free for life. 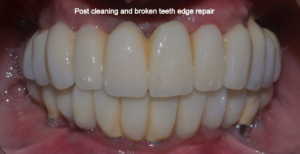 Any patient undergoing a major cosmetic dental procedure or a smile makeover done using crowns and veneers will receive a lifetime of free maintenance of the restorations which would include procedures such as cleaning and polishing around the restorations and fixing of any de-bonded restoration over the period of time. All patients undergoing full mouth rehabilitations including full jaw implants, single jaw implants, All on four and all on six dental implant procedures to replace missing teeth at our dental clinic in Pune will receive a lifetime of free maintenance of the restorations which would include procedures such as cleaning and polishing in and around the prosthesis, tightening of any loose screws of the abutments and cleaning of the prosthesis extra-orally in an ultrasonic cleaner whenever required. Mr S received a full set of dental implants and teeth prosthesis at Smilekraft Dentistry in the year 2016. 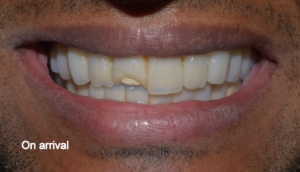 He had come all the way from the USA for such extensive dental treatment. 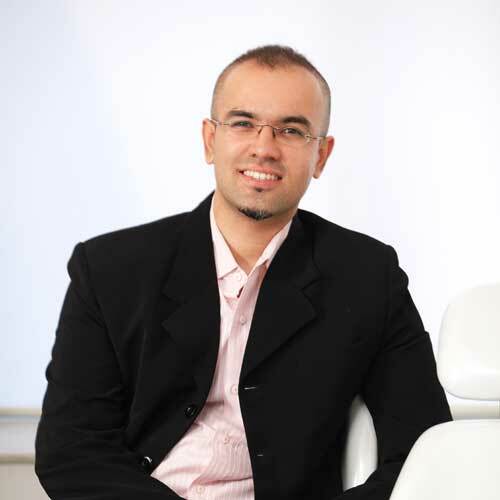 The dental implants at the first stage surgery were fitted with a long term temporary dental prosthesis that were designed to last him for a year till he planned to return back for the permanent ones. But due to other personal and work commitments he couldn’t make it back to us till the year 2018. 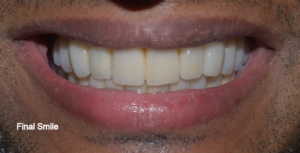 By that time, the following picture showed his then dental prosthesis condition. One of the artificial teeth was marginally fractured while another one had a thick incisal edge fracture. Apart from that, the teeth were in need of a general cleaning procedure to remove the tartar stuck around them. Now ideally, we were supposed to make a new set of permanent teeth for him, but due to his time constraints, we decided to simply continue with the same set of teeth following some maintenance procedures. 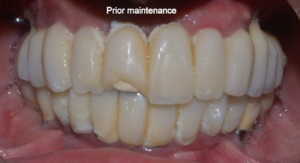 The dental cleaning around the implants was a part of our regular maintenance commitment. The minor repair work for the front two teeth was carried out with simple composite bonding (chargeable) on them to give back their original natural appearance and function.